Today’s Wednesday Words is a writing called “Anyway” attributed to Blessed Teresa of Calcutta (a.k.a. Mother Teresa), a Roman Catholic religious sister and missionary who dedicated her life to serving the poor and the sick. For me, it serves as yet another reminder to keep less-than-happy things in perspective and to focus on what really matters. The first time I really remember hearing and remembering this prayer was at a high school youth group retreat in 2001. 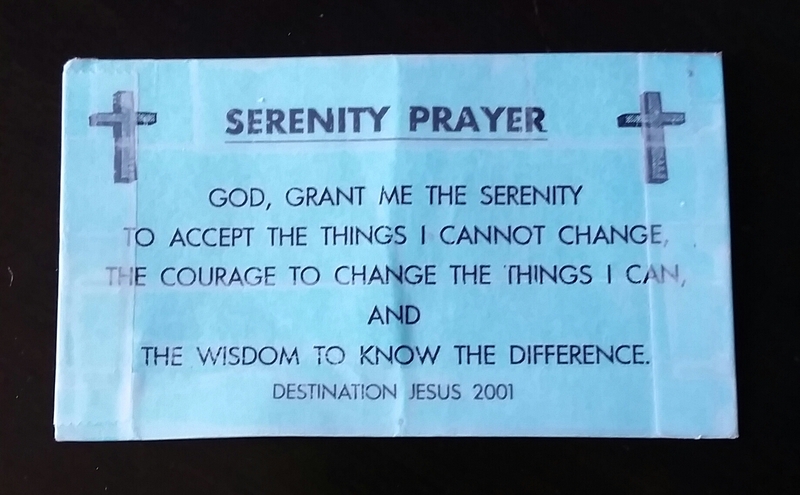 Everyone received a little teal blue card with ‘The Serenity Prayer’ on it, and it’s been with me on my nightstand or taped to my desk ever since, no matter where I’ve lived. I couldn’t at the time pinpoint exactly what it was that drew me to it, but as I’ve grown up and become more self-aware (and honest with myself), it HAS to do something with the fact that I’m a control freak. Not as much now as I was in my teens to mid 20s, but it’s definitely still in me – just to a lesser degree now. And I think this prayer has a lot to do with it. It crosses my mind when I’m frustrated or worried or upset with just about anything – friends, family, spouse, work, etc. And it forces me to not only realize and remember that I cannot control everything around me, but also think ‘do I really NEED or WANT to control things’? The answer a lot of times now is no. There are far more important things to focus on, so I change my attitude about whatever it is and move on. In my opinion, life is just way too short and flies by way too fast to live any other way. …it would hands-down be Pharrell’s “Happy”! Heck, on one of my first dates with my now-husband, we were going to dinner at Logan’s Roadhouse, and on the speakers in the parking lot they were playing Brooks & Dunn’s “Boot Scootin’ Boogey”. You better believe I started doing my own version of a line dance right then and there. The look on hub’s face was pretty priceless, but I figured he had to know what he was getting into right from the beginning – ha! What music video would YOU want to be a part of?? J.K. Rowling for the WIN. 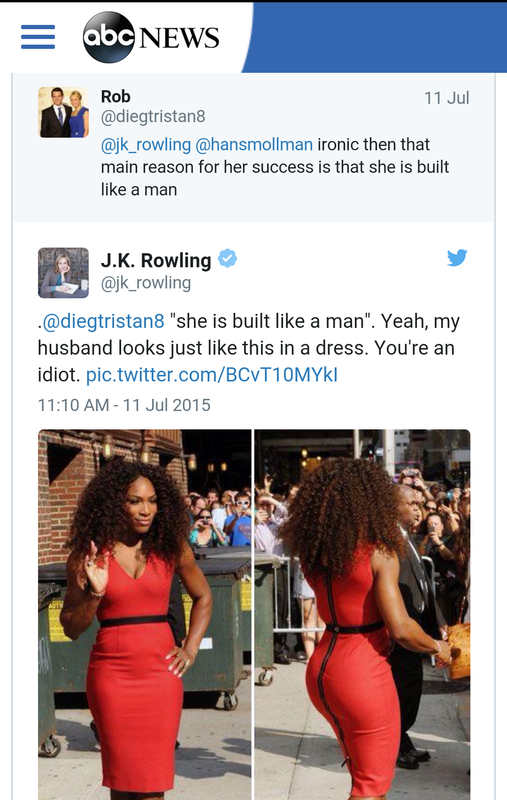 Last week, some troll on Twitter responded to author J.K. Rowling’s tweets in support of Serena Williams and her success at Wimbledon by making a rude comment about her body. Rowling responded in the most perfect way ever. Well played, J.K.
Around this time every year (and again in December at the beginning of college basketball season), I re-watch Jim Valvano’s acceptance speech after receiving the Arthur Ashe Courage and Humanitarian Award at the inaugural ESPY Awards in 1993. I don’t remember watching the initial speech – I was 9 years old – but no matter how many times I see it and how much time has passed, I am incredibly moved and touched every. single. time. Then, last year, Stuart Scott was the recipient of the Jimmy V Perseverance Award while he was in the midst of fighting the battle of his life against cancer and delivered a speech that was on-par with Jimmy V’s words. Stuart Scott was an anchor on ESPN’s SportsCenter and made sports news FUN 🙂 It wasn’t just his catch phrases that I remember so clearly, like “BOO-yah”, “cooler than the other side of the pillow”, “he must be butter ’cause he’s on a ROLL”, but also his spirit and obvious love of all things sports. My mom and I would watch SportsCenter together while we were having breakfast in the morning when I was in junior high and high school, and he always made us laugh. The SportsCenter pennant that hangs in my office has a lot of the common SC catch phrases, and many of them are attributed to Stuart Scott. Those words and the ones he delivered at the 2014 ESPYs will permanently be ingrained in my mind. Earlier today, a story came across my newsfeed on Facebook about a new shoe technology that Nike is releasing – Flyease. This innovation allows people with physical limitations to more easily put on their shoes, giving them independence to do a task that so many of us don’t even think twice about doing every day. The article and video (below) go into detail about how the need for this type of technology was brought to their attention. A teenager named Matthew Walzer who has cerebral palsy wrote to Nike several years ago asking if they could help. He was tired of having to ask his parents or his friends to put on, take off, and tie his shoes. Over the next few years, Nike worked directly with Matthew to develop and test what would eventually become the Flyease technology. The structure of the shoe and how it works is fascinating to me. Genius, really. But what’s even more amazing is how the simple act of a teenager writing to a global billion dollar company – and being persistent with his question – has led to technology that will help an immeasurable amount of people.